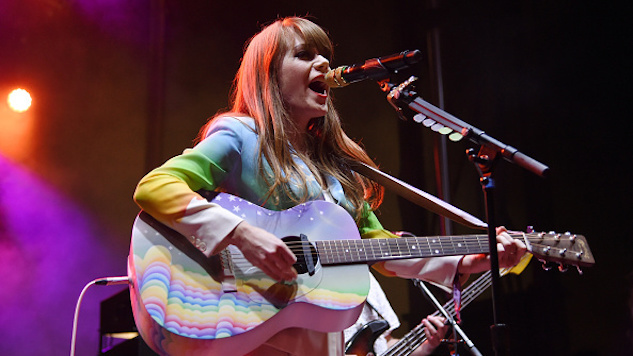 Late last year, Jenny Lewis teased that her new album, one of our most anticipated of 2019, was on its way early this year. After unleashing a pair of suspicious tweets on Tuesday night, Lewis has confirmed the new record is called On The Line, and it’s dropping March 22 on Warner Bros. Records. The news arrives with the album’s first single, “Red Bull & Hennessy,” which you can hear below via a twinkly accompanying visualizer. “Red Bull & Hennessy” is Lewis’ first new music since her 2014 album The Voyager, and on this love song-turned-party song, she makes an invigorated return in a fit of bluesy electric guitar, “high on Red Bull and Hennessy.” She teases and taunts (“Don’t you wanna kiss me? Don’t you wanna even try?”), only to proclaim she’s “higher than you.” After five silent years, the singer/songwriter and former Rilo Kiley frontwoman is back and burning brighter than ever. On The Line features an impressive supporting cast, including Beck, Benmont Tench, Don Was, Jim Keltner, Ringo Starr and Ryan Adams. In addition to the album details, Lewis has also announced more tour dates (including some supporting Death Cab for Cutie), which you can find below. Again, you can listen to “Red Bull & Hennessy” below and preorder On The Line here. Keep scrolling for the On The Line tracklist and album art, plus Jenny Lewis’ tour dates.